HE1000 V2 remains a cutting-edge, full-size headphone intended for reference use in the home or studio. At much less than 0.001 mm, its Nanotech planar magnetic driver is so thin it is not visible from the side with the naked eye. New features include an improved headband design that is lighter and stiffer yet will accommodate a wider range of head sizes. And the sound quality has been significantly improved. 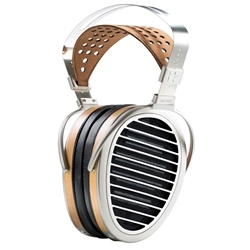 The ear cups are also slimmer further reducing weight and increasing comfort.